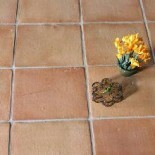 Terracotta tiles require a sanded grout. The sand in the grout ensures that it will not separate or break down prematurely. Handmade terracotta tiles are naturally irregular so they need wider grout lines of approx 10mm, making the sanded grout even more important. Grouting occurs 24 hours after setting the tiles. This eliminates the chance of shifting or uneven floors from the weight of your body when you walk on the floor. The choice of grout is a personal one, you can either mix your own sand and cement mortar or purchase a ready mixed grout that is available in a range of colours. If using a tinted grout colour pigments can stain the unsealed edges of terracotta so partly sealing these edges may be recommended. Remove all the spacers from between the tiles. If they will not lift out using your fingers, pull them out with a set of pliers. Scrape down any tile adhesive that protrudes up more than one-third of the thickness of the tile. Sweep away the debris from the joints. An option is to mask over expansion joints along the installation area. Mask both horizontally across the tiles and vertically between the tiles to eliminate any chance of excess grout getting into the joints. Read the instructions on the back of the grout bag. Heed all warnings and guidelines for mixing and protecting yourself from grout dust inhalation. Put a small amount of water into a clean bucket. Add in grout and stir until the mixture is a smooth, creamy paste consistency. Follow the grout manufacturers’ mix ratio and mix only as much grout as you can use in 30 minutes. Wait three minutes and then stir the mixture again. This provides time for the grout to absorb the water. Grout is never mixed to a runny or liquid consistency. Fill a small bucket with water and drop the sponge inside. Get the sponge wet and wring it out. Wipe the grout joint with the damp sponge and then place the sponge back into the bucket of water. Lift a dollop of grout out of its bucket with the rubber grout float. Place it directly on top of the joint. Drag the grout float diagonally while holding it at a 45-degree angle to the tiles. Continue raking the float across the joint in this manner until you have tightly packed the entire joint. Wipe the surface of the tiles immediately with your damp sponge to remove any excess grout. Where needed, scrape large amounts of excess from the tile with the flat edge of the grout float. Continue wiping the tiles until you remove all the grout and haze. If the grout dries on the tile it will be nearly impossible to get back off. Shape the grout joint with a shaping tool. Continue grouting around all the tiles in this manner, changing your sponge water frequently to avoid spreading a watery grout mixture onto the tiles. After 30 minutes of grouting, sponge over the grout joints to smooth them out and blend the lines with the tile edges. Remove the masking tape, being careful not to distort the grout lines. Discard the old grout and clean the bucket when the grout starts setting. Mix a new batch of grout. Adding more water will not make the grout usable. Leave the grout to cure for 24 hours before sealing the tiles. Avoid any contact with the floor, including walking on it, during that time. This entry was posted on June 20, 2013 by Living Terracotta in Installation tips.